Survival saws come in a variety of styles in two primary categories, straight blade or flexible blade. Of the straight blade designs, there are either short folding saws, such as the Gerber or Sierra Saw, or a bow saw style such as the Sven or Survivor. In the flexible saw category there are the various wire saws (which we'll be looking at in a follow-up article) and the link or chain saw style. The original of the this style was the Pocket ChainSaw (formerly known as the Short Kutt Pocket ChainSaw) by Supreme Products. Until recently, it was the only one available. Now, another chain saw has debuted, the Saber Cut from Ultimate Survival (Survival, Inc.). A brief recap is in order. One advantage of the flexible saws is that the are small, light and compact. The wire saws are smallest and lightest, but don't cut as fast as any of the other styles. Sawing anything very large is a real effort. The chain saw style, on the other hand, is very fast, cutting on three sides at once. You can easily fell a six inch diameter pine tree in a matter of a few minutes if you apply yourself to the task. While heavier than a wire saw, they are still fairly light weight and compact. The disadvantages are that they the cannot easily be used one-handed like a straight saw can, nor do you have very much control compared to a straight saw. No matter what type you select, a small pocket saw, part of your folding knife or multi-tool, is still very useful and none of these is really a replacement for that. Only the small saw can be used for fine work and that comes in handy around camp or on the trail. Both these saws perform essentially as a human powered chain saw. It is absolutely amazing how fast you can cut decent sized wood with these saws. Easy enough so that you can easily use it for constructing more secure shelter than might otherwise be possible. 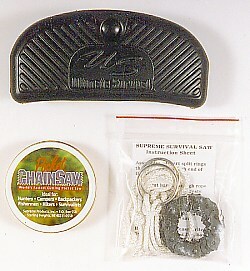 The Pocket ChainSaw stores in a small can ( 2 3/4" Diameter x 7/8" High) with a screw-on top. Weight is 5.04 oz. (143 grams) for the saw, 1.13 oz. (32 grams) for the tin and 6.17 oz. (175 grams) total. The saw is 27 inches long. A "utility" version (the Supreme Utility Survival Saw) is available at 22 inches and comes without a storage can or ring style handles. The utility saw is equipped with simple nylon line loops which attach with split rings to the saw and a zipper-lock plastic bag storage pouch that saves a few ounces (total weight 3.49 oz. (99 grams). Its supposed advantage is that it won't rattle in the can as the original style will, annoying to hunters and the military, but packing some cloth in the can before closing it solves that problem for us. Without the storage can it is also more compact and that can be important to some, though the difference is small. Optional nylon rod handles are also available that fit both saws, but add considerably to the size of the package and must be stored separately. Price is $20 for the original, $16 for the utility. The "flat" links are riveted together. Dual teeth alternate sides on each link, making a 1/8 inch wide cut. The teeth are similar to those found on a conventional carpenter's saw, though symmetrical so they cut on both strokes. Metal ring handles slip onto the ends for handles, but work best if a piece of wood is slipped into them for a more comfortable grip (as illustrated in the accompanying instructions. While seemingly a little stiff at first, it works very well once in use. It doesn't hurt to keep it well oiled, both from a functional standpoint and also to prevent rust, but we've never had a problem with it even when not well oiled. A set of illustrated instructions are included with the Pocket ChainSaw. In use, the saw cuts cleanly, but care must be taken to keep it aligned in larger diameter logs/trees or it can bind. It cuts fast, but it will clog on rare occasion in some woods. That has been at worst a minor annoyance when it has occurred over the years. The ring handles, which you can hold only with a single finger, are uncomfortable to use without improvising a better handhold with small pieces of a branch. It is somewhat difficult to use with two persons, but can be done. The Saber Cut Survival Saw stores in what appears to have been originally designed as a molded foam-rubber eye glass case (3 x 6 1/4 x 1 3/4 inches). The molded foam-rubber case floats, even with the saw inside, if it is dropped in the water inadvertantly. If it wasn't so difficult to pack the saw back in the case, that might be a more appealing, if not exactly necessary, feature. 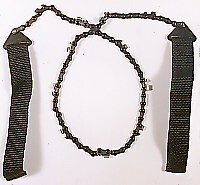 A trap allows it to be attached to yoru belt. The saw weighs in at 4.05 oz. (115 grams), the case at 2.11 oz. (60 grams), for a total all-up weight of 6.16 oz. (175 grams). 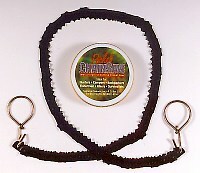 Length is 25 inches with 1 inch nylon webbing loops affixed permanently on either end. Price is $30. This saw more closely resembles a real chain saw with conventional, though small, links and chain saw style teeth. One of the things that we noticed immediately was that along the entire length there were only 11 teeth alternating sides along the length, 1 1/4 inches on center. Each alternating pair were facing opposite directions so it would cut on both strokes. Quite frankly, it looks odd, but it works and that's all that matters. The teeth saw a 1/4 inch cut in the wood. They could be sharpened with a chain saw file, if you know what you're doing. The links make this saw very flexible and easy to use. It handles fairly significant misalignment well. It cuts very fast and didn't clog once in our relatively limited tests. 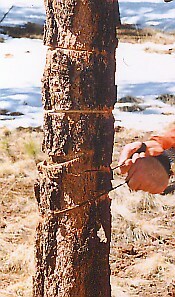 On smaller diameter branches, it starts to grab as the cut nears the end, but by then it's easy to finish it off by breaking or with a knife. The handles are reasonably comfortable. It works well with two persons. No instructions were included with our sample. It should be noted that more than a few woodsmen have cobbled together a saw similar to this from an old chain saw chain. Likely where the idea came from. The primary difference is that these will cut in only one direction. The price is right, but you'll have to spend the time putting handles on and all that, then it'll still cut only about half as fast. In a survival situation, a saw is a nice option. First priority is a pocket saw which can be very useful for a myriad of tasks. A larger saw, as reviewed here, is something of a luxury, but very handy to have. The less experienced the survivor, the more important such a saw becomes. If you are going to use such a saw, the ability to cut fast is an important criteria and the chain saw style saws are the fasted available, by a large margin. While both of these saws cut smaller diameter wood, in the range of an inch in diameter, the Saber Cut requires a slightly larger diameter to function smoothly than did the Pocket ChainSaw. The Pocket ChainSaw cuts more like a conventional saw and will give a clean cut nearly every time. How important that is in a survival situation is debatable, but if you also plan to use it around the home for pruning, as many do, then that is something to consider. We're not sure it makes a lot of difference in the real world of survival. Both cut fast and relatively easily. The Pocket ChainSaw seems to do better on hardwoods like Oak and Mesquite, the Saber Cut does slightly better on softer woods like Pine and Aspen. the differences are relatively minor. The Pocket ChainSaw seems to work slightly better in dead, dry woods than the Saber Cut. The Saber Cut requires the user to take full strokes to cut, with the teeth spaced out as they are. The Pocket ChainSaw will cut with shorter strokes, albeit not as effectively. that could be a concern in some situations with limited mobility. Among our testers, they split right down the middle as to which was their favorite. Both stayed sharp for the duration of our tests. Either saw seems capable of doing the job in a survival situation. Your choice is probably going to come down to either price, size or weight. The Supreme Utility Survival Saw is the lightest, most compact and least expensive. The original Pocket Chainsaw is still relatively inexpensive and still much more compact than the Saber Cut. If any of those attributes are important criteria for you, then it's your saw. If size and weight are not a concern and you can afford it, the Saber Cut makes a better choice being slightly easier and more comfortable to use overall (though the optional handles for the Pocket ChainSaw eliminate comfort as a factor). For evaluations of the other survival saws available, check out "Toothed Sharps". © 1998, 1999 Douglas S. Ritter & Equipped To Survive Foundation, Inc.